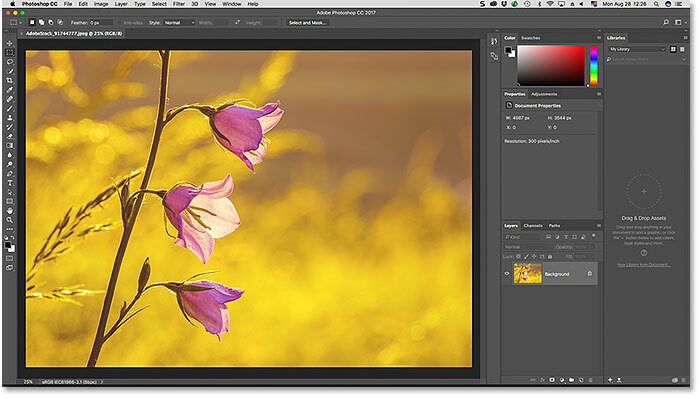 Learn all about Photoshop workspaces. You'll learn what workspaces are and how to use them to streamline and customize Photoshop's interface. Covers the default Essentials workspace, Photoshop's other built-in workspaces, how to save your own custom workspaces, and more! In this tutorial, we'll learn all about workspaces in Photoshop. 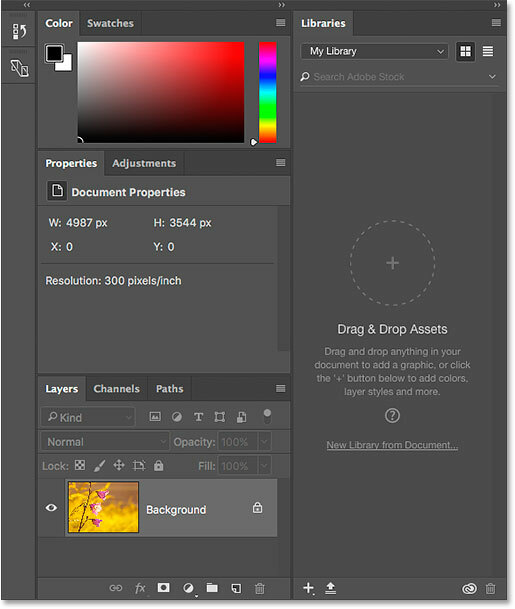 A workspace is a preset layout for the various elements that make up Photoshop's interface. 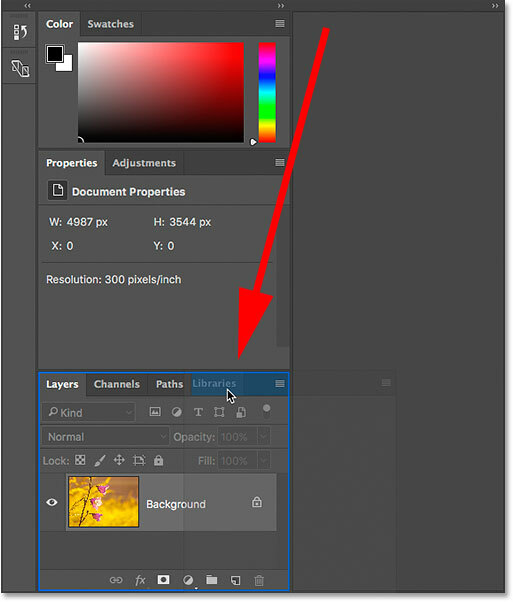 Workspaces determine which of Photoshop's panels are displayed on your screen and how those panels are arranged. A workspace can also change which tools are available in the Toolbar and how the Toolbar is organized. 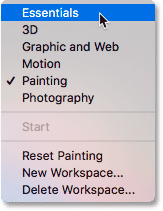 Workspaces may include custom menu items in the Menu Bar, and even custom keyboard shortcuts. Any or all of these elements can be included and saved as part of a workspace. Workspaces give us a way to customize Photoshop's interface for specific tasks, and to better match the way we work. Photoshop includes far too many panels to fit them all on your screen at once, so it's important that we limit the panels to just the ones we actually need. A photographer, for example, will use certain panels for image editing and retouching. A digital painter, on the other hand, will need different panels, ones for choosing brushes and colors. Other tasks, like web and graphic design, video editing, or working with type and typography, all use specific panels. A workspace streamlines the interface for the task at hand, keeping your screen free of clutter and helping you work more efficiently. In a previous tutorial in this Photoshop Interface series, we learned all about managing panels in Photoshop. We also learned how to customize the Toolbar, a new feature in Photoshop CC. While the Toolbar can now be saved as part of a workspace, as can menu items and keyboard shortcuts, workspaces are most commonly used for switching between different panel layouts. So for this tutorial, we'll focus on the panels. We'll look at Photoshop's default workspace, as well as other workspaces that are built into Photoshop. We'll learn how to switch between workspaces, and even how to save, update and delete our own custom workspaces. Finally, we'll learn how to restore the default workspace when we need it. This tutorial has been fully updated for Photoshop CC. If you're using Photoshop CS6, you'll want to check out the previous Saving And Switching Workspaces In Photoshop CS6 tutorial. This is lesson 9 of 10 in our Learning the Photoshop Interface series. Let's get started! 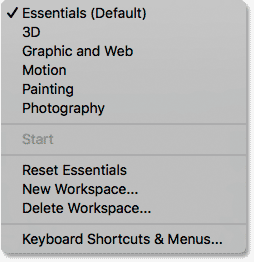 The default "Essentials" workspace in Photoshop. Photo credit: Adobe Stock. 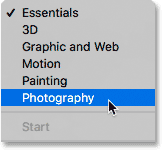 The panels included in Photoshop's default Essentials workspace. Photoshop's workspaces can be found by going to Window > Workspace. The same list of workspaces appears. Switching to the Photography workspace. Switching workspaces changes the panels that are displayed on your screen. Let's look at the differences between Photoshop's default Essentials workspace and the Photography workspace. Notice, for example, that the Libraries panel, which was in its own column on the right in the Essentials workspace, is now grouped in with the Adjustments panel in the middle column. This frees up more room for viewing the image in the document window. The panel layout for the Photography workspace. The panel layout for the Painting workspace. Switching back to the default workspace. The original panel layout has been restored. 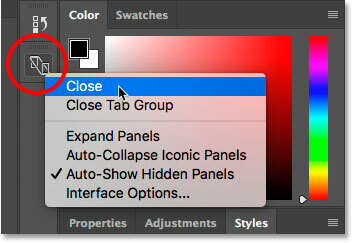 Let's make a few quick changes to Photoshop's default panel layout. When we're done, we'll learn how to save the new layout as a custom workspace. I covered moving and arranging panels in the Managing Panels tutorial, so I'll go through this quickly. Dragging the Libraries panel into the Layers, Channels and Paths group. 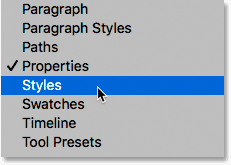 Opening the Styles panel from the Window menu. 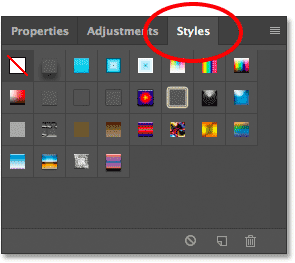 The Styles panel opens in the same group as Properties and Adjustments. Dragging the Styles panel into the Color and Swatches group. Closing the Device Preview panel in the left column. 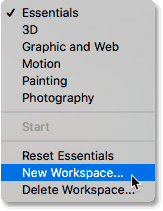 Clicking the Workspace icon and choosing "New Workspace". Naming and saving the new workspace. The new workspace has been added to the list. 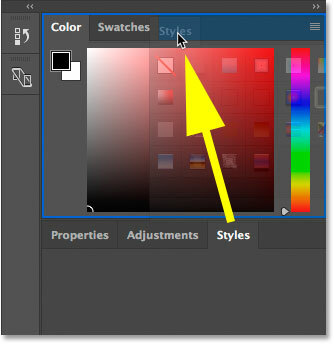 If you make further changes to your panel layout, you can save the changes by updating the workspace. You won't find an actual "Update Workspace" option anywhere. Instead, the steps for updating a workspace are the same as saving the workspace. We just save it using the same name as before. Go up to the Window menu, choose Workspace, and then choose New Workspace. Or, click on the Workspace icon and choose New Workspace. 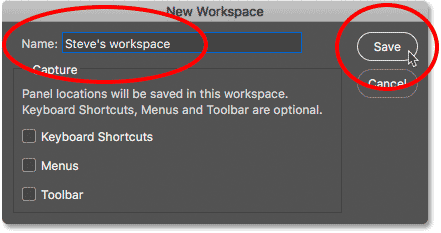 In the New Workspace dialog box, enter the exact same name as the existing workspace. In my case, it would be "Steve's workspace". Then, click Save. Photoshop will re-save the workspace with your changes. 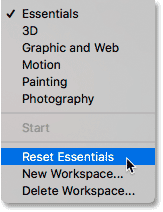 Choose "Essentials" to return to the default workspace. The custom layout remains even after choosing the Essentials workspace. Why are we still seeing the custom layout? Well, if you remember back to when we created our custom layout, I said to keep in mind that we created it by making changes to the Essentials workspace. The problem here is that panel layouts are “sticky”. This means that Photoshop remembers our changes to the layout. And, it keeps those changes active until we specifically tell it to revert back to the default layout. So, since we’ve made changes to the Essentials workspace, it’s not enough to simply select it again. To revert back to our default panel layout, we need to reset the workspace. Resetting the Essentials workspace cleared the custom layout. 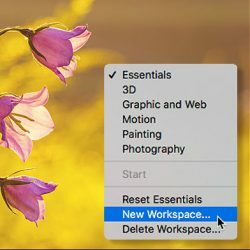 Choosing the "Delete Workspace" command. Selecting and deleting my custom workspace. Confirm that you want to delete the workspace. The custom workspace has been deleted. And there we have it! That's how to use the built-in workspaces, and how to create and save your own custom workspaces, in Photoshop! In the next and final lesson in this series, we'll learn how to hide the interface and give your image more room on the screen using Screen Modes in Photoshop!